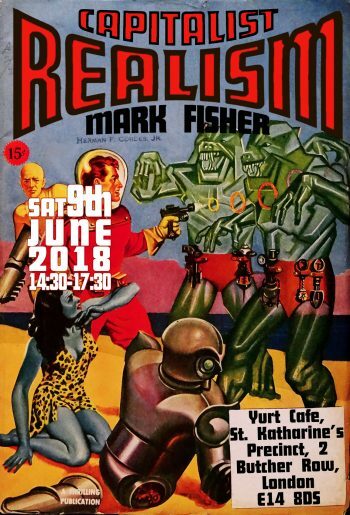 Join us in June for the second in the series of book clubs on Capitalist Realism by Mark Fisher, continuing with chapters 4-5 (pages 21-38) on education and mental health. If you would like to facilitate one of the following sessions please get in touch. This book club will take place on *UNISON, a lifeboat-turned-project-space. We will meet at Yurt Café near Limehouse station at 2:30pm and depart at 3pm to reach the boat moored nearby. DOWNLOAD Fisher, Mark (2009). Capitalist Realism: Is There No Alternative? Winchester: Zero Books. Capitalist Realism was published one year after the 2008 financial crisis, when it became clear that the priority was to return to business-as-usual, rather than tackling the systemic failure of the financial sector, which caused the crisis. Mark Fisher’s book was a desperate attempt to question the unshakable belief that “there is no alternative” to capitalism and thereby introduce alternative conceptions of social and economic organisation into public discourse. Drawing on Frederic Jameson, Slavoj Zizek and Kafka, Fisher emphasises that capitalism requires our complicity in order to function, that we effectively endorse capitalism through our actions and choices rather than our convictions, and that far from being a radical practice, anti-capitalist critique is a feature of capitalism. He draws on William Burroughs and Gilles Deleuze to argue that we have transitioned from a traditional disciplinary regime to a society of decentralised control, where the control imperative is internalised by the subjects of capitalism in self-assessment and self-surveillance. Fisher uses Burrough’s figure of the “control addict” to unpack the pathologies of capitalism, represented by addiction to instant gratification in the vicious cycle of “depressive hedonia”. This state of distraction is characterised by an inability to concentrate and synthesize time into a meaningful narrative. Time is experienced as a series of unrelated, ahistorical present moments “ready-cut into digital micro-slices” (p. 25), a state of mind that forestalls intentionality. Rather than a mere lack of motivation, Fisher understands this “interpassivity” as a symptom of reflexive impotence; an unstated worldview that results from the knowledge that “things are bad”, and more importantly from the knowledge that we “can’t do anything about it” (p. 21). Why do we feel impotent in an era of unsurpassed cultural freedom and technological progress? Fisher argues that the state of reflexive impotence manifests as a retreat from the public sphere into a private space of consumption. Despite the hyperconnectedness available through social media, does this retreat into interiority extend to sites of collaboration and exchange, such as education, research and creative practice? For Fisher, reflexive impotence is also associated with pathologies and mental disorders. Why and how does this “pathologization already foreclose any possibility of politicization”? (p. 21). On the topic of education, Fisher examines the contradictory status of students, who are both subjects of disciplinary institutions and consumers at the same time. Mirroring the paradoxical predicament of the students, teachers are in turn interpellated by students as authority figures in disciplinary frameworks, while they are simultaneously expected to respond to students’ consumer demands. Moving onto the subject of employment, Fisher scrutinises the collapse of Fordism and with it the sites and strategies of working class politics in the transition to post-Fordism, casualised labour, flexibility, decentralisation and precarity. He argues that any resistance to the new labour conditions would be self-defeating because these reforms have been brought about in large part by workers themselves. At the same time, old forms of resistance are useless in this new environment. The old Fordist antagonism between worker’s unions and capital has been internalised in workers, who are caught between traditional class conflict and their new role as investors seeking a maximum return on their pensions. Drawing on David Harvey and Alain Badiou, Fisher argues that neoliberal politics is in fact a return to class privilege, capital accumulation and elite power. Fisher emphasises the need to reframe our disidentification with the system in political terms by shifting the political terrain away from the unions’ traditional focus on pay and onto new areas of discontent. For Fisher it is important to contest the capitalist appropriation of the new and to develop a new language that can elucidate these contradictions. Are these new political configurations emerging already, as the battle lines are re-drawn in identity politics? What would Mark Fisher have said about Brexit, rising nationalism and xenophobia in the rhetoric of neoconservatives, for whom “citizens of the world are citizens of nowhere”? Arguing that precarity disturbs the stability of working time and space, as well as our emotions and affective states, Fisher draws on Richard Sennett to address the affective changes in the post-Fordist reorganisation of labour and the associated stresses on mental health. Considering the significant rise of mental illness, which has almost doubled in states that have implemented neoliberalism, Fisher condemns the ideology of social mobility that raises delusional aspirations and places responsibility on the individual to achieve material success. Fisher considers the repoliticisation of mental illness an urgent task in the challenge to capitalist realism. What contradictions do we face in our labour and creative practice? What effect do these situations have on us? How can we respond to these contradictions in our everyday life? Mark Fisher was a writer and theorist on music and contemporary culture. He wrote for the Wire, Frieze, New Statesman and Sight & Sound. He was a founding member of the Cybernetic Culture Research Unit, a Visiting Fellow at Goldsmiths University of London and maintained k-punk, an influential blog on music and cultural theory. *UNISON is a floating assembly space founded to allow for showcases and experiments on an intimate scale. The oval shape and transient nature of the endeavour mark the parameters for explorations by artists and practitioners of all walks of life. The boat is a statement for the DIY: anti institutional, anti university, anti establishment : open to all. Fisher, Mark and Richard Capes (2011). Capitalist Realism: An Interview with Mark Fisher. More Thought’ Interviews, 10 Nov 2011. Deleuze, Gilles (1992). Postscript on the Societies of Control. October 59 (Winter 1992), pp. 3-7. Foucault, Michel (1977). Discipline and Punish: The Birth of the Prison. Trans. Alan Sheridan. Harmondsworth: Penguin. Kafka, Franz (1999/1925). The Trial, trans. Breon Mitchell. New York: Schocken. Burroughs, William S. (1959). Naked Lunch. Paris: Olympia Press. Burroughs, William S. (1970). The Electronic Revolution. Gottingen: Expanded Media Editions. Baudrillard, Jean (1994). Simulacra and Simulation. Ann Arbor: University of Michigan Press. Jameson, Fredric (1983). Postmodernism and Consumer Society. In The Anti-Aesthetic: Essays on Postmodern Culture. Seattle: Bay Press, pp. 111-125. Jameson, Frederic (1991). Postmodernism, or, the Cultural Logic of Late Capitalism. Durham, NC: Duke University Press. London: Verso. Zizek, Slavoj (1989). The Sublime Object of Ideology. New York: Verso. Freud, Sigmund (1961/1920). Beyond the Pleasure Principle. Trans James Strachey. New York: Norton. Foucault, Michel (1988). Technologies of the Self. In Technologies of the Self: A seminar with Michel Foucault, L. H. Martin, H. Gutman, P. H. Hutton eds. Amherst: University of Massachusetts Press. Heat (1995). Directed by Michael Mann. 2h 50min. The Godfather (1972). Directed by Francis Ford Coppola. 2h 55min. Goodfellas (1990). Director: Martin Scorsese. 2h 26min. Sennett, Richard (1998). The Corrosion of Character: The Personal Consequences of Work in the New Capitalism. New York: Norton. Marazzi, Christian (2008/2002). Capital and Language. Los Angeles: Semiotext(e). Kenning, Dean (2010). Capitalist Realism: Is There No Alternative? Review. Art Monthly No 333 (Feb 2010), pp. 33-34. The Invisible Committee (2009). The Coming Insurrection. Los Angeles, CA: Semiotext(e). For additional suggestions please see Mark Fisher: Capitalist Realism Part 1.